Rejecting a modern urban twist on the traditional wooden chair ( at 180 Euro a pop) which the Mrs was rooting for, I opted for a more traditional design at half the price. Hand made in Kalamata by the same fellows who are making a bed for Olaf - to arrive on the day my daughter lands in Greece - I am more than happy. 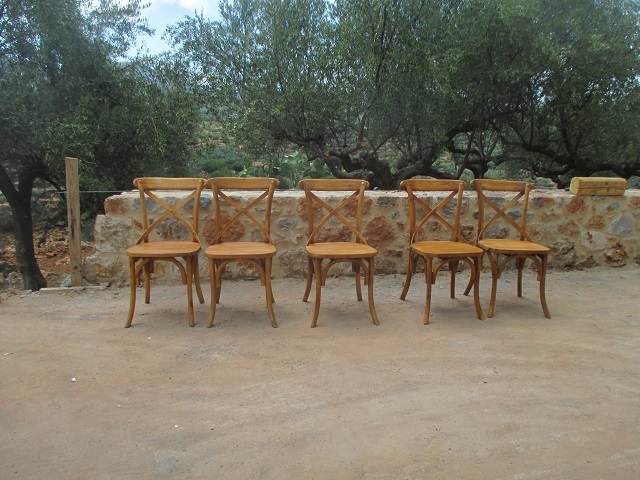 There should have been six chairs but it appears that one of those packed speedily away into the car of George the Architect, my shopping guide, has a defect. I told George we should beware Greeks bearing gifts which, I think, went over his head. He is returning the chair - as he knows the fellows at the factory - to get a replacement. Anyhow I now sit in more comfort as I work, the chairs pro tem rest on the veranda outside the Bat Room which will - next month - be covered in terracotta tiles.